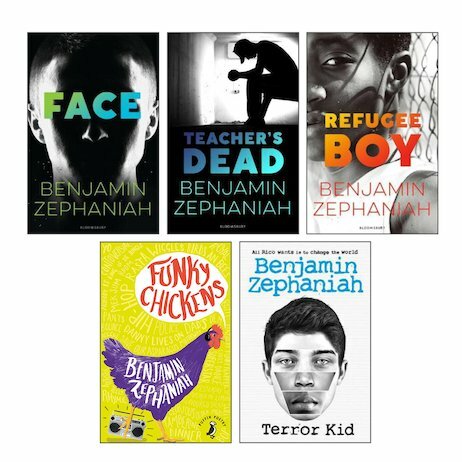 Benjamin Zephaniah: here’s a writer we could talk about for a while. He’s every bit as interesting as any character in his books. Dub poet. Musician. Rastafarian. Thinker. Renegade. He’s done a lot. Oh – and he grew up amid Birmingham’s urban gangs, so he’s got the been-there-and-done-it badge, too. And that authenticity comes through loud and strong in this dynamic pack of in-your-face fiction: a raw, exciting, brutal look at growing up on the margins. From terrorism and gang violence to refugees and racism, there’s no topic this author daren’t tackle. But just when you fancy a bit of light at the end of the tunnel, there’s also comic relief in a book of his funny poetry, too.